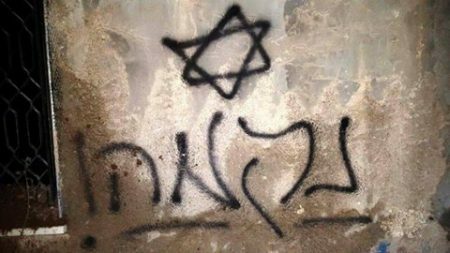 Extremist Jewish settlers last night smashed three parked vehicles and spray-painted racist graffiti on walls after raiding the village of Turmus-Ayya, to the northeast of Ramallah, in the occupied West Bank, according to Palestinian security sources. Settlers from the illegal settlement of Shilo, nearby, broke into the village in middle of the night, where they attacked three parked vehicles and partially destroyed them with batons . They also spray-painted racist graffiti on walls, WAFA reports. Later on Friday, Israeli police claimed that they have opened a probe into the attack which was attributed to the racist group “price tag”. “Price tag” refers to an underground anti-Palestinian Israeli group that routinely attack Palestinians in the occupied territories and inside Israel. The Israeli government still refuses to label it as a terrorist organization and considers it only as group of vandals.